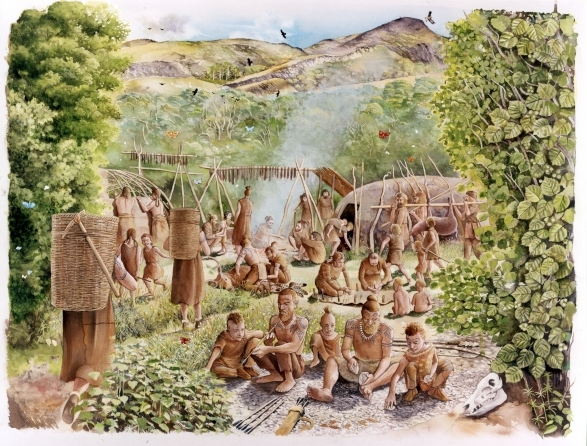 Approximately 9,000 years ago, a small band of Mesolithic hunter-gathers chose a high ridge over-looking the River Bann in modern day Co. Derry as their home. Here, in a forest clearing, they erected a series of tent-like structures, fashioned out of wooden posts and covered in hides or thatch. 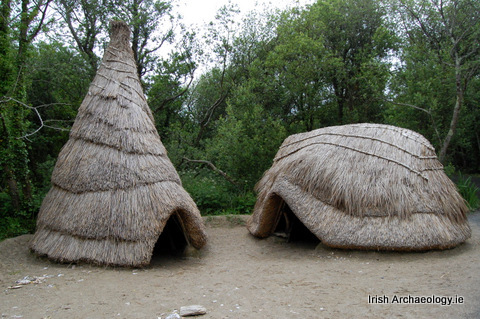 These simple buildings represent Ireland’s very first houses. With no knowledge of farming, their inhabitants had to rely totally on the natural world for sustenance. In this regard, the campsite at Mount Sandel was well chosen. Not only was it surrounded by dense forests full of wild pigs and close to a river abundant in fish, rich coastal and estuarine resources were located relatively nearby. This ancient camp-site was rediscovered in the 1970s during a series of excavations carried out by Dr Peter Woodman. This work revealed extensive evidence for habitation, including the remains of at least ten structures (though not all were contemporary), along with a large number of pits, post-holes and hearths. Where discernible, the majority of structures appeared to be broadly oval in plan, measuring approximately 6m across. Located in shallow man-made depressions, they were defined by stout post-holes, which measured up to 0.20m in diameter. 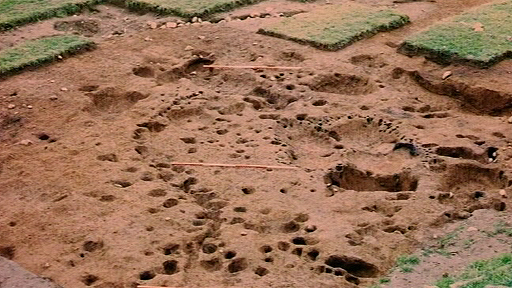 A number of the post-holes were inclined inwards suggesting that they may have held wooden saplings that had been driven into the ground and then bent over to form a tent or wigwam-like structure. Presumably the resultant wooden framework was covered in hides, reeds or some other perishable material. Internally the huts had a centrally placed hearth, which would have provided the inhabitants with both heat and light, as well as somewhere to cook their food. The faunal remains from the site indicated that a wide range of species were exploited by the camp’s inhabitants. Fish bones dominated, forming 81 % of the assemblage, with the remainder being made up of mammal (15%) and bird bones (4%). The fish remains included species such as salmon (48%), trout (32%), eel (7%), bass and flounder and these indicate that the nearby River Bann was intensively exploited. The fish were probably caught using harpoons, nets or baited lines, while more complex fish traps may also have been used. Mesolithic fish traps, fashioned out of post and wattle panels and wicker baskets are known from other Irish sites, for example Clowanstown, Co. Meath and Spenser Dock, Dublin. Evidence for wooden racks, over which the fish would have been dried or smoked to aid long-term storage, were also identified at Mount Sandel. In addition to the fish remains, a variety of birds species were found at the site and these indicate that diverse range of habitats were being exploited. Species of the forest such as wood-pigeon, woodcock and capercaille were hunted, along with waterfowl such as mallard, teal, widgeon and red-throated diver. Upland habitats were also utilised as evidenced by the recovery of grouse bones. Interestingly, eagle bones were found at the site and these birds may been hunted for their plumage rather than for meat (ethnographic parallels indicate that eagle feathers were often incorporated into clothing and head-dresses). The mammal bone, in contrast was less diverse and was dominated by wild boar (98%), with much smaller amounts of hare and wolf/dog also present. 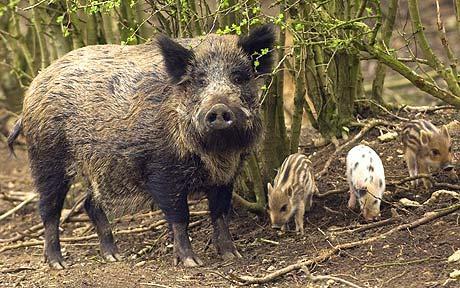 The pig bones suggest many of animals were hunted and killed within their first winter. Wild plant resources were also exploited, especially hazelnuts, water lily seeds and crab apples. Hazelnuts were particularly plentiful and may have been an important part of the Mesolithic inhabitants diet. Easily harvested in the autumn, the nuts would have been an excellent source of protein, fat and vitamins and could be stored for up to 12 months once cured. The inhabitants of Mount Sandel used a variety of wooden and stone tools, and there was extensive evidence for flint knapping at the site. There appears to have been a specialised flint-working area to the west of the huts, from which large amounts of flint debitage and numerous microliths were recovered. The latter are tiny flint blades, which were probably used as part of composite tools. 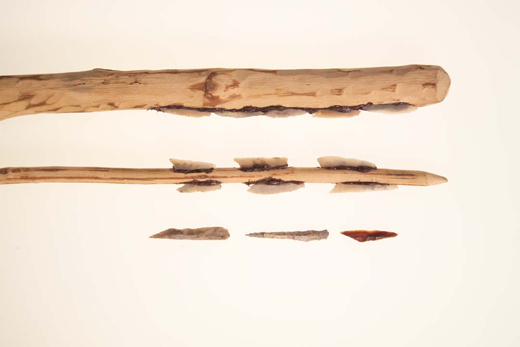 For example, a number of microliths may have been inserted along the length of a wooden handle to form a cutting blade or at the end of a wooden pole to make a harpoon or spear. Polished stone axes were also recovered during the excavation and these tools would have been essential for everyday carpentry work, as well as clearing woodland. Mount Sandel then, gives us a unique insight into the lives of Ireland’s very first inhabitants. Home to what was probably a small extended family group, the camp appears to have been occupied for most of the year. Its residents were adept at exploiting the natural world, targeting migrating salmon during the summer months, harvesting hazelnuts in the autumn and hunting wild pigs during the cold days of winter. They slept in sturdy huts that were warmed by internal hearths and to-date these simple structures represent the only definite Mesolithic houses discovered in Ireland. Interestingly, the archaeology students of University College Dublin are currently recreating one of these Mesolithic structures. You can read more about this intriguing project here. A fascinating insight into the life of ancient Ireland…I always love your blog posts! Some years ago I was driving along the coast-line, can’t remember exactly where. I saw a sign on private property indicating a monastic site but allowing entry. I went in and, from the almost buried site, could see the Skelligs. Later, far away in Wales, I was told that this would have been the Mother House for the monks on Skellig Michael. Is this correct? If so, is it still accessible? And can you give me an exact location. I’ll be in Ireland Nov 8 – 20 and, for the first time for years, not guiding a group or looking after grand-children. This is my opportunity to explore and relax and this mystery place is calling.